Under the series of Smrtis collectively known as Dharma-sastra, Visnusmrti or Vaisnava Dharma-sastra occupies an unique place. 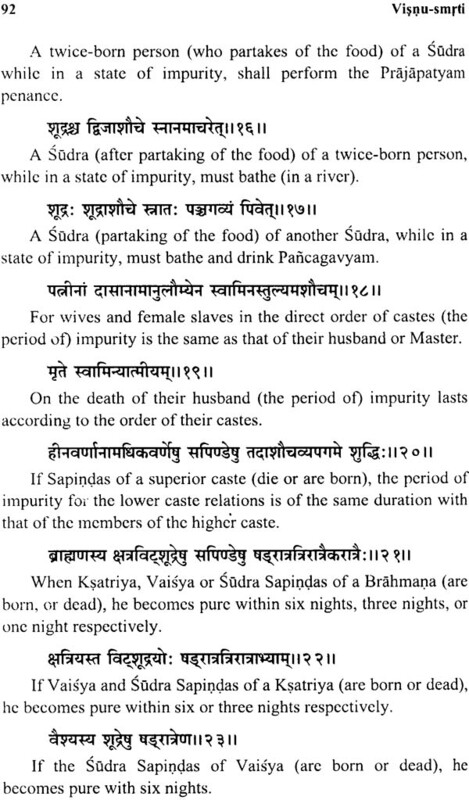 There are many smrtis ascribed to the names of various Rsis like Vyasa, Parasara, Manu, Yajnavalkya, Atri etc. But visnusmrti is famous after the name of lord Visnu himself. This foremost of the Dharma Sastras ha been promulgated b y the god himself. It contains one hundred chapters in total. 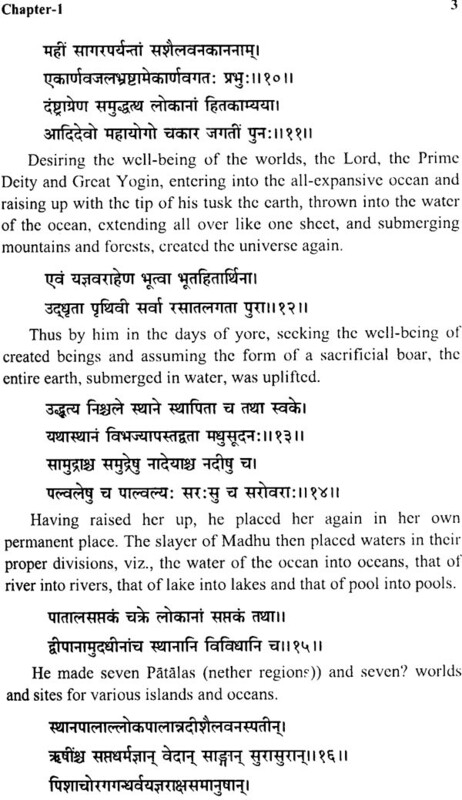 In the beginning of this treating, lord visnu felt a desire of creating creatures; knowing the earth to be under water, he, as in the cycle before, uplifted the earth supported upon the auspicious (figure of the) boar, delighting to sport in the water. The initial chapters after chapter one describe the duties of the four-casts, duties of the King and also laws relating to treasure-finds. 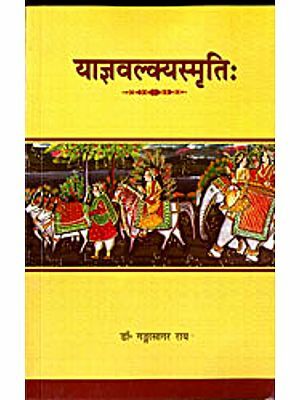 The subsequent chapters deal with the laws of purification, viz., Upakarman, Utsarga, Upanayan, Purifying Mantras from the Vedas etc. and penances, viz., Tarpana, Pitr rites. 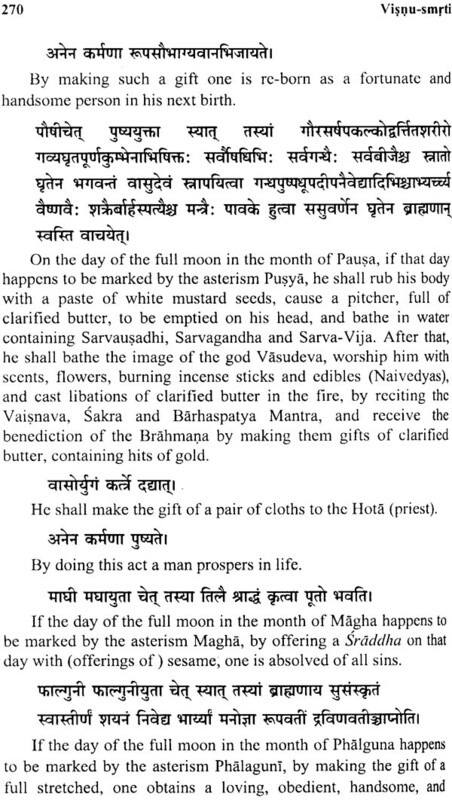 Apart from these rites, the code of Visnu elaborates about the duties of Brahmans, duties of owner and servant etc. It also mentions about the three kinds of Property of a house-holder and their comparative moral worth's. 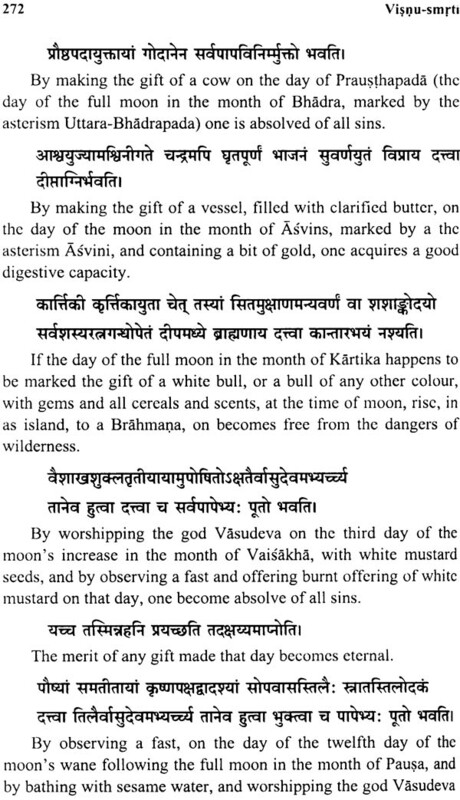 The present translation of Visnusmrti by M.N. Dutt is an authentic English translation with various notes at appropriate places for researchers. The Editor of the present book has further enhanced the English Translation by replacing older usage of English words with the corresponding modern words. 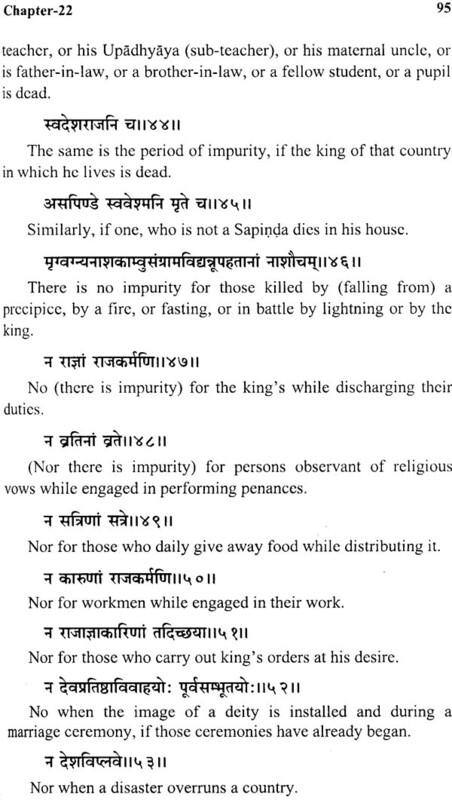 He has done a good labour to put Sanskrit text and English translation side by side for the benefit of readers. Further, he has corrected various diacritical notations that were incorrectly used in the earlier edition. 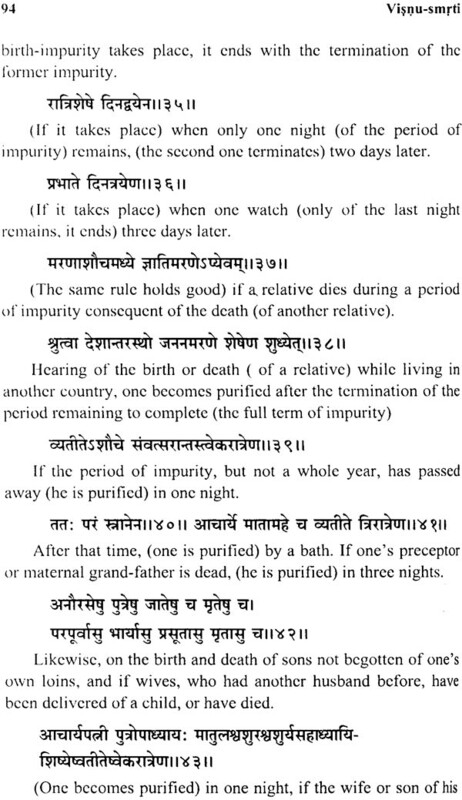 Also the text has been corrected at appropriate places for a better edition of Visnusmrti. The Scriptural writings of the Hindus are divided, mainly, into two classes Sruti (or what is heard) and Smrti (or what is remembered). The earliest and the most sacred religious work of the Hindus, namely, the Veda, belongs to the former. In it the words of revelation are preserved in their original state. 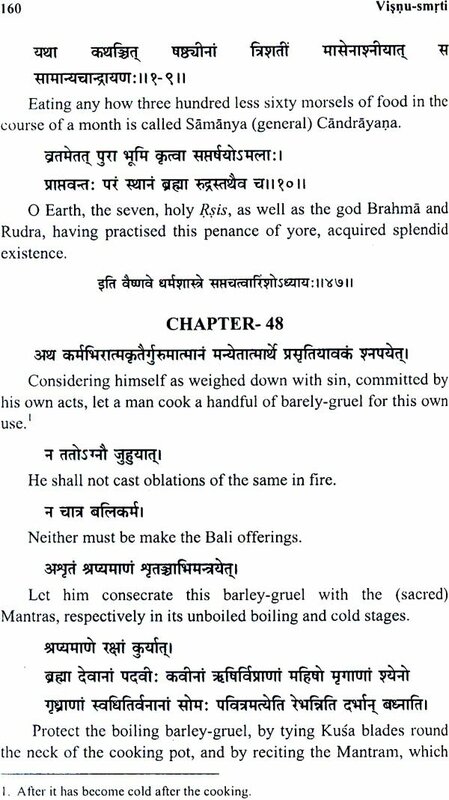 And all the law, civil and religious; which govern and regulate the life and conduct of the Hindus pass under the sacred appellation of Sruti. According to the belief of the Hindus, Smrti also is of divine origin; the difference between it and the Veda consists in the fact that in the Hindu System of Law the sense is recorded either in the divine words or other equivalent expressions. 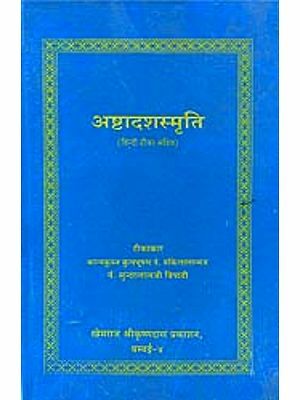 The Taittiriya Aranyaka, describes Smrti as one of the sources of Dharma. The history of the origin of Smrti attributes it to the Self- Sprung Brahma who communicated it to Manu, who again taught it to the ten patriarchal sages, viz., Marici, Atri, Angira, Pulastya, Pulaha, Kratu, Praceta, Vasistha, Bhrgu and Narada. 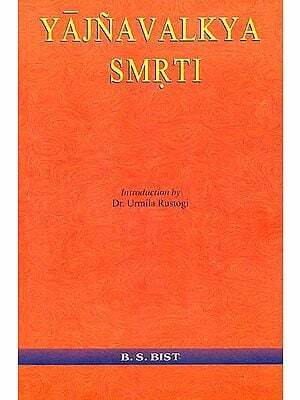 Smrti consists of three sections, viz.,- (i) Acara or regulations relating to the performance of religious rites and ceremonies and the general.duties of men; (ii) Vyavahara or civil law relating to the protection of life and property with all their rules and practices; and (iii) Prayscitta or those relating to the atonement for various sins committed. But all these groups of laws, religious, civil .and about atonement, pass by one comprehensive term which i popularly known as the Dharma- Sastra. 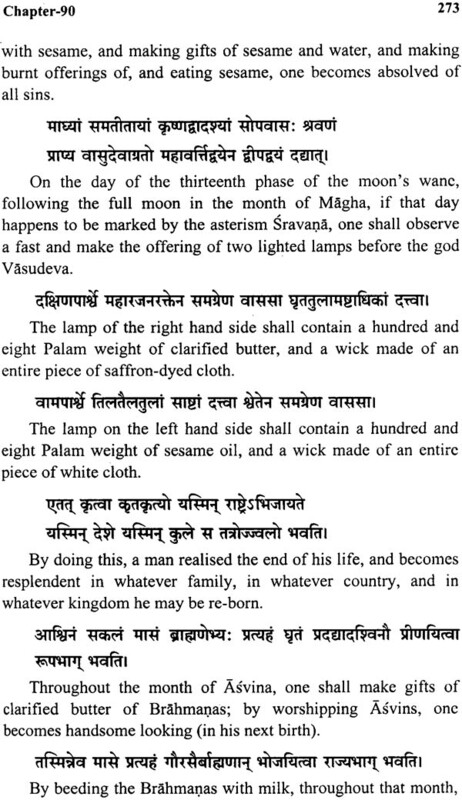 Under the series of Smrtis (or Code of law) collectively known as Dharma-sastra, Visnusmrti or Vaisnava Dharma-sastra occupie an unique place among these scriptures. 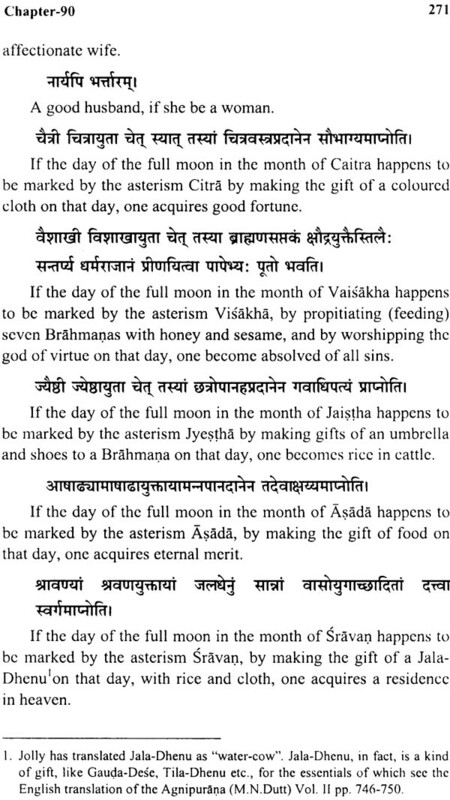 There are many smrtis ascribed to the names of various Rsis like Vyasa, Parasara, Manu, Yajnavalkya, Atri etc. but Visnusmrti is famous after the name of lord Visnu himself. This foremost of the Dharma Sastras has been promulgated by the god himself. Brahmanas, who study or teach this Law code, acquire an elevated status in the celestial region. This (code) is holy, auspicious, life-prolonging, and heaven awarding. It imparts fame, knowledge, opulence and good fortune. This (Code) should be studied, remembered, heard and recited to others. Persons, deserving good, shall hear it, narrated during the celebrations of a Sraddha ceremony. It contains one hundred chapters in total. 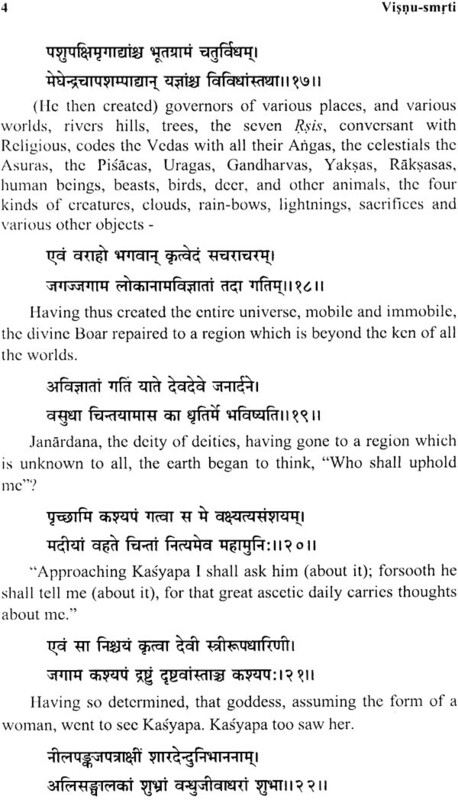 In the beginning of this treatise, lord Visnu felt a desire of creating creatures; knowing the earth to be under water, he, as in the cycle before, uplifted the earth supported upon the auspicious (figure of the) Boar, delighting to sport in the water.